The molecular scientists at Bioventix have a depth of experience and a track record to quickly convert your antibody into a recombinant form to increase production yields or convert to a FAb to remove effector functions and thereby potentially reduce background noise in diagnostic assays. The starting point to the creation of recombinant antibodies is the isolation of the genes that code for the heavy and light chains. These can be from an existing rodent, human or sheep cell line or can be isolated de novo using an antibody library approach. The variable sequences for the heavy and light chains are cloned into our proprietary expression vectors. The heavy and light chain expression cassettes are combined into a single expression ‘supervector’ to facilitate the equal co-expression of antibody heavy and light chains from the CHO cell. This allows the persistent and stable expression of whole antibodies (IgG) or antibody FAb fragments in CHO cells. The expression of the antibody from the CHO cell is then enriched and amplified through rounds of single-cell cloning or by using a fluorescent activated cell sorter (FACS) to select for those cell clones that are the most productive. The use of the DHFR gene that increases its copy number when stimulated with a selection agent, enables the yield of antibody to be increased rapidly and consistently. After the best clones have been selected they can then be scaled up for antibody production. The result can be a cell line that produces grams of antibody per hollow fibre production run. 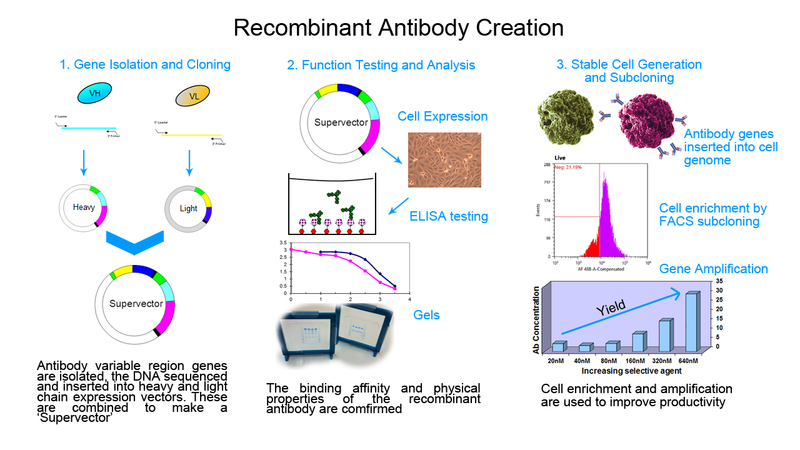 Our recombinant antibodies and FAbs retain the binding characteristics of the parental antibody as confirmed by biological assay and protein analysis by electrophoresis, iso-electric focusing and HPLC chromatography.